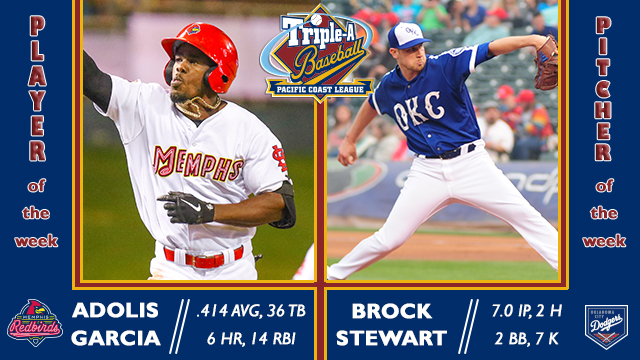 ROUND ROCK, Texas - The Pacific Coast League announced Monday that Memphis Redbirds outfielder Adolis Garcia and Oklahoma City Dodgers right-hander Brock Stewart have been selected as the Player and Pitcher of the Week for the period of July 23-29, 2018. Garcia had one of the most productive weeks in professional baseball, pacing all players in Major and Minor League Baseball with six home runs, 36 total bases and 11 extra base hits, while posting a 1.241 slugging percentage, a mark that was higher than all but one player. Additionally, he hit .414 (12-for-29), reached base at a .433 average, good for a 1.675 OPS. Garcia also drove in 14 runs and scored nine runs. The 25-year-old was the key cog for a Redbirds offense that hit 16 home runs for the week, averaging over eight runs a game. Garcia had hits in all six contests, with his first 11 going for extra-bases. On July 26 in Salt Lake, Garcia recorded the seventh three-homer game in Memphis history - and the second this season. He hit a three-run homer in the opening inning, added a grand slam in the sixth inning and a solo shot in the eighth inning. His eight RBI matched the most by a player in a single-game in the PCL this season, while his three home runs is a feat that only five other players in the League have accomplished this year. Garcia also homered in three other games, each of which was a Memphis win. Garcia has been with Memphis all season, hitting .267 (87-for-326) with 19 home runs, 60 RBI and a team-high 170 total bases in 92 games. He has heated up over the last month, hitting .363 (33-for-91) with a 1.174 OPS in 24 July contests. Garcia, who entered the season as a consensus top-30 prospect in the Cardinals organization, signed with St. Louis as a free agent out of Cuba in February 2017. In his two years in the organization, between Double-A Springfield and Memphis, Garcia has hit .280 (216-for-771) with 34 home runs and 125 RBI. This is his first career Player of the Week honor. In his only outing of the week, July 26 against Albuquerque, Stewart took a no-hitter into the seventh inning. He allowed only one run in his seven innings of work, striking out seven, but didn't factor into the decision of the Dodgers' 4-1 win. The Isotopes first hit came to lead-off the seventh; they would score their lone run later that inning on another single. Stewart allowed only three other baserunners, two coming via walks and another from an error in his 88-pitch outing. Stewart has split the season between Oklahoma City and the Major Leagues, where he has been recalled to Los Angeles on six occasions. In 12 games at Triple-A, all starts, Stewart has worked to a 2.83 ERA (57.1 IP, 18 ER) with 17 walks and 50 strikeouts. He is in his fifth season in the Dodgers organization after getting drafted by Los Angeles in the sixth round in 2014. Stewart has appeared in Oklahoma City each of the last three seasons, where he has a 2.73 ERA in 125.1 innings. This is his second career Pitcher of the Week award, with his previous honor coming in 2016 with the Single-A California League's Rancho Cucamonga Quakes.